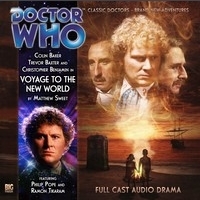 Hard on the heels of their Jules Verne-style trip to Venus, the Doctor, Jago and Litefoot arrive on the shores of New England not long after the Pilgrim Fathers have staked their claim to the New World in fair Virginia. But the first settlement has disappeared, the colonists vanished like ghosts, the native Indians suspicious of the new arrivals – and there is something decidedly peculiar haunting the beaches…. who are the silent children, and why have they latched onto Henry Gordon Jago? And who is the Old Man of Croaton, who knows so much about time? It does take a few minutes to get started properly: there’s a sub-plot about Ramon Tikaram’s Wanchese losing his position in the tribe that needs to be sorted before the action can really get under way. And once that does happen, the pace is very slightly odd, with Jago finding himself stranded on a mysterious island and “adopted” by a ghostly child while Litefoot and the Doctor struggle to uncover the mystery of the missing colony (and the missing theatrical entrepreneur). There’s a time loop involved, and a paradox that must be reset, but where this trope can sometimes feel a bit too well-trodden, Sweet has found a fresh and decent angle to pitch his tale. Colin Baker’s Old Sixey has to do a fair amount of cajoling and persuading to get matters back how they should be. For what is undoubtedly a one-off (well, a two-off) made on a budget, and intended to be a specially-priced offer to entice listeners into the J&L range, this Voyage manages to overcome its limitations to sound far bigger and more ambitious than it has any right to be. For the most part it succeeds too, and it’s a pity that – for the foreseeable future at least – we won’t be seeing Jago and Litefoot continuing their adventures with the Doctor. They work particularly well with Colin Baker’s theatrical Six. If you’re going to buy one of them, then buy both. Less than a tenner as downloads for two excellent adventures? Damned good. ← My God, You Should Have Seen Us!